i have the opportunity to get a waterdragon and i dont know much about them. i do have some experience with reptiles, namely lizards, as weve had iguanas, beardies, geckos, and chameleons. so i wanted to get some insight before i jump into this just because the lil guy needs a home. i know they eat worms and crickets and need water and heat but are they easier to handle than iguanas? how is their temperment? anyone had both an iguana and a dragon? did you like one more then the other? I know someone more knowledgeable will come along (so *bump*), but I just wanted to say that all of the water dragons I've handled were complete sweethearts. I really fell in love with each and every one of them. "The real revolution is the revolution of consciousness." Yes, water dragons are calm and i feel in love with each one i saw to. They are beautiful. They run so cute to. With their hands sometimes up in the air like a criminal running from a cop not wanting to get shot. Lol u just need to have a safe open space to see them do it. i just ran across this post in a search, but for what its worth i own both a baby water dragon and a baby green iguana. the water dragon is an awesome pet, hes super friendly and loves to be around people. he doesnt have to be held he can just chill on your shoulder or roam around with watch, as he doesnt get into anything. the iguana on the other hand is very hard to handle. he doesnt bite or anything but he is really scared of people and runs frantic when you try to get him out of his cage. he has to be held or he will run and hide and if he does get away, which he has, he will be gone for a while. hes a big work in progress, but iguanas do calm down in time and with lots of handling. go with a water dragon, awesome pets, they get to be a good size, not too huge and they are super cool. Yes but keep in mind the babies are alot easier to die from lack of proper care. They can not have too high of humidity and to low is bad to. The pet stores humidity is like at 40 where they say it should be 85. It is very hard to keep your tank that high and when you do, it could cause your water dragon's respiratory to fail. Your uvb lighting is VERY important as well. Some will be lite up but not putting off the uvb rays. You will know if your dragon hasn't shedded sense you baught him or sense the last shedding. That and i believe their poo looks less digested. You can use a home made humidifier that has a timer. Otherwise 3 to 4 times a day of spraying! But, they are so beautiful and so cute. Like she said, they chill out in your hands mostof the times. They go into a trans when rubbing their belly. Dunno if that is healthy or not but when they come out of it, they look confused and scared. That is usually when they try running out of your hands. What ever you do, do not grab his tail as he tries excaping your hands. He will run off but stop in a spot for a while. So, that is how you find them before a preditor does like your cat or dog. We have a bearded dragon. I'm not normally a lizard person, but I love him. He is so passive, and it's kind of like having a dog. He roams the house, and never gets into any trouble. He even likes cuddling. I don't know about water dragons, but if you have the chance I recommend looking into beardies, they are great. yup, we had tow beardies. LOVED them and grew quite attached. both were very mellow. we just hada hard time with the feedings. ours preferred mice/pinkies to worms. (they were spoiled) so we tried raising them ourselves. bad idea! there ended up being a hundred in no time and i started getting attached to the cute babies. so we ended up selling mice to the pet stores until they had too many. and the stink.... it was just too hard to keep up. but the little dragon i had the opportunity to take in did find a wonderful hom eand being treated like royalty. (i get text pics all the time) maybe after the baby is born and a little older we will get another pet to add to the zoo. "So, Lone Star, now you see that evil will always triumph because good is dumb. " Hi, I have a few reptiles - a water dragon, 2 corn snakes, a bearded dragon, 2 tortoises and 5 terrapins. 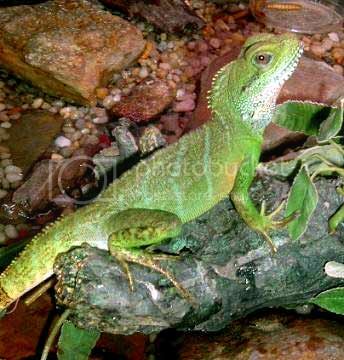 Out of all them I think that a water dragon is the best pet to have, because they are the easiest to look after, they just need fresh water and live food (crickets and worms), fresh fruit now and again but not too much and heat. They dont grow too big but are not too small neither, they are very friendly and mine always stands at his glass door when he wants to come out. Of all the pets (scales, feathers and fur) my 2 water dragons were the easiest to care for. I adopted them when their owner could no longer care for them. They came to me in pitiful shape but within a month I had them plump and happy. They only thing I couldn't cure was the damage that had been caused when they were anxious and rubbed the tips of there little noses off in their old enclosure. So if you go with a water dragon and you notice them rubbing their little noses raw find out what is bothering them fast and fix it.